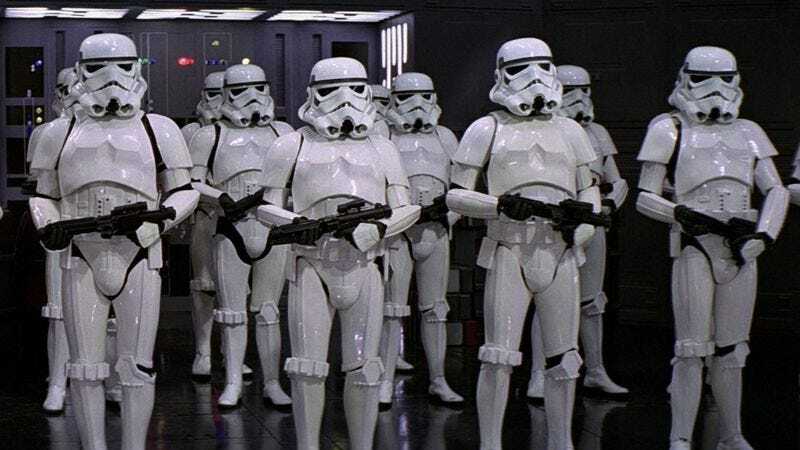 In the latest outrage for advocates of open carry and the Empire, a man dressed as a Stormtrooper caused a commotion in Salina, Kansas, after locals spotted his blaster rifle and called the police—apparently not realizing that Kansas had legalized open carry that very day, thus ensuring everyone who clings to their guns as tenaciously as their ideologies could bring them right out into the streets. Of course, this particular person carrying a gun around in public was also dressed as a Stormtrooper, which is clearly crazy. Indeed, best to call the authorities right away. Of course, when officers arrived, they discovered that this was not an everyday Kansan expressing his legally protected rights to wield a rifle in broad daylight, but rather some kind of Star Wars weirdo doing stuff on the Internet. Specifically, he was Chris Burns, whose somewhat-popular Vine series Stormtrooper Sam finds him doing everyday Kansas things while dressed as one of the Empire’s henchmen—such as shopping, or toting around an assault weapon. After a brief investigation determined that Burns was, in fact, a Stormtrooper, he was turned loose—as citizens were reassured that a Stormtrooper posed no threat, even if he had started shooting. For peace of mind, Kansas residents are hereby asked to please refrain from wearing any goofy costumes while they’re carrying their guns around.